It was the depths of the Great Depression, and newly-elected President Franklin D. Roosevelt and his team were at work devising ways to rebuild the nation’s economy by putting Americans back to work. A conservationist like his relative and former president, Theodore Roosevelt, the idea for a “tree army” to work in the nation’s forests to protect them from erosion, as well as replenish them, had been planted long before Franklin’s rise to the presidency and the nation’s economic collapse. So, it was no surprise that the development of the Civilian Conservation Corps, or the CCC as it was best known, was among the first of the many programs of the New Deal in the 1930s. 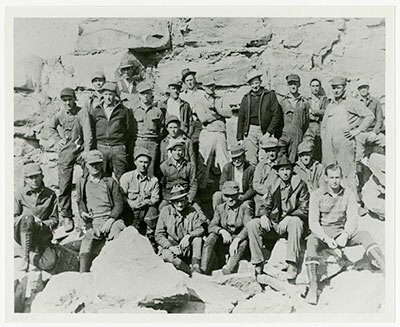 On March 21, 1933, Roosevelt presented the Emergency Conservation Work (ECW) Act to Congress, calling for the creation of the CCC. 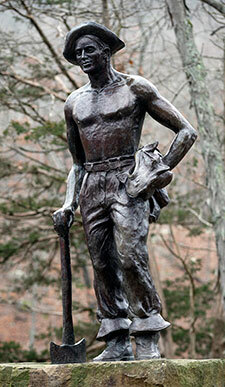 Its mission was to provide jobs working in the nation’s forests for about 300,000 unemployed young men. Applicants had to be unmarried and physically fit males between the ages of 18 and 25 (the maximum age was later raised to 28). About 30,000 veterans of World War I were also recruited for the program. Each man earned $30 a month, $25 of which was sent home to his family, during the typical six-month enrollment period. The Labor Department recruited the men while the Army operated the camps. The agriculture and interior departments created plans and supervised the projects. From 1933 to 1942, CCC workers accomplished “the most effective large-scale environmental protection and restoration program ever undertaken in our country,” according to the book Our Mark on This Land: A Guide to the Legacy of the Civilian Conservation Corps in America’s Parks. At its peak in 1936, the CCC had about 600,000 workers in 2,514 camps in the nation’s 48 states and territories. Throughout the program’s existence, about 200,000 Arkansans served in the CCC, working on projects both in-state and across the nation. CCC workers planted about three billion trees, built more than 800 parks and blazed over 28,000 miles of hiking trails. 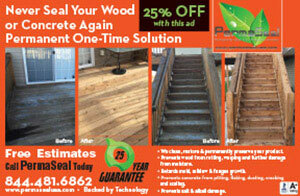 In addition, they protected thousands of acres of forests from erosion and built nearly 50,000 bridges. They also constructed lakes and dams, and hundreds of fire towers. World War II put an end to the CCC, which was dissolved by Congress on July 1, 1942. As the young men departed for the war, they left behind a legacy that endures to this day. In Arkansas, the most visible and perhaps treasured part of that legacy is in the Arkansas state parks they helped build. 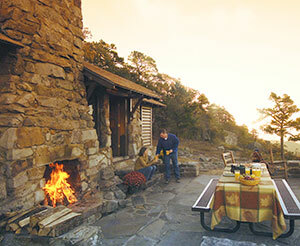 Arkansas, began building the infrastructure and amenities of Arkansas’ first state park. The crowning jewel of their work is the Adirondack-style Mather Lodge, complete with native rock and logs, overlooking Cedar Creek Canyon. It was named after Stephen T. Mather, then director of the nation’s national parks. Arkansas leaders had sought national park status for the scenic Petit Jean Mountain near Morrilton, but Mather suggested it was a better fit for a state park. 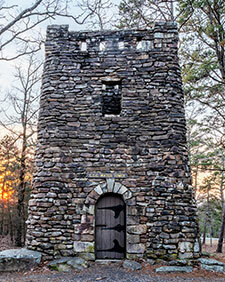 overlooks, hiking trails, a water tower and other structures that have stood the test of time. The work of the company is now preserved in three national historic districts containing more than 80 buildings, structures, trails and bridges listed on the National Register of Historic Places. They also quarried stone and built a dam to create Lake Bailey. Blending beautifully in the natural setting, the CCC structures are as much a part of the parks’ offerings as the scenic beauty. The lodge was renovated in 2012 in a $4.3 million project that emphasized keeping the work of the CCC and later that of the Works Project Administration (WPA) intact. In 2008, the park dedicated the “Iron Mike” statue to commemorate the work of the CCC at Petit Jean and other state parks. Company 1780-V, arrived at Mount Nebo State Park near Dardanelle in July 1933. Led by Capt. 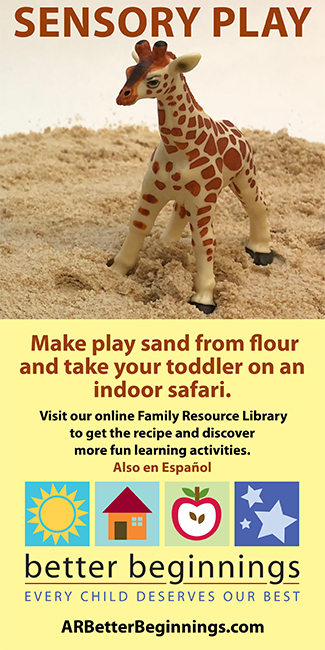 H.L. Eagan, 186 CCC workers brought 20 tons of equipment up the steep terrain of the 1,350-foot mountain. Like the company that built Petit Jean’s structures, this group included World War I veterans. They built rustic-style cabins, pavilions, bridges and 14 miles of hiking and now mountain biking trails that remain at the heart of the park’s offerings today. Located at the site of the pioneer homestead of Benjamin Crowley along a unique geological ridge formation near Paragould, this park was built by three CCC companies at CCC Camp 1727. Starting in 1933, workers built a dam for a spring-fed lake, a bathhouse, pavilion, campground, picnic sites and hiking trails. In 1924, Arkansas Power and Light Company built a dam along the Ouachita River for power generation, which created Lake Catherine. The company later donated more than 2,000 acres surrounding the lake to the state for a park. 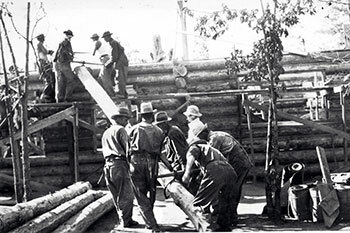 In 1937, CCC Company 3777 began work there, building cabins, stone walls, bridges and a lodge, which burned in 1948. 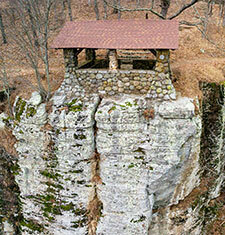 The CCC also developed the Buffalo River State Park, now known as Buffalo Point, within the Buffalo National River. The state park was created in 1938, and the CCC structures, which include cabins, are part of a historic district on the National Register of Historic Places. The park became part of the Buffalo National River in 1972. 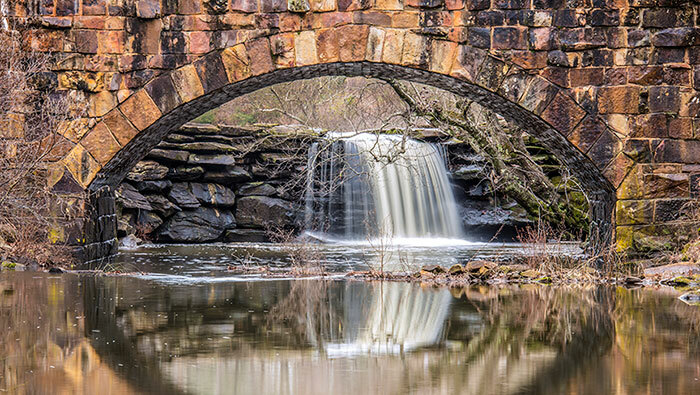 Beyond the state parks, the CCC’s handiwork can still be seen across the state at such places as Boyle Park in Little Rock and White Rock Recreation Area in Northwest Arkansas. 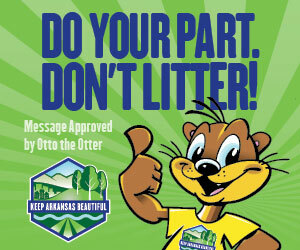 For more information about the state parks, visit arkansasstateparks.com. Sources: “Arkansas State Parks: The Legacy of the CCC” by Craig Ogilvie, Arkansas Department of Parks and Tourism; “The Civilian Conservation Corps in Arkansas, 1933-1942” by Sandra Taylor Smith and published by the Arkansas Historic Preservation Program; The Encyclopedia of Arkansas History & Culture; Our Mark on this Land: A Guide to the Legacy of the Civilian Conservation Corps in America’s Parks.